Key priorities in 2019 would be to stabilize macro-economic conditions and keep inflation under control, coupled with higher economic independence and national competitiveness. Vietnam’s export-import turnover in the first 10 months of 2018 nearly reached $400 billion, and the figure is expected to exceed $475 billion by the end of the year, which means it is going to set a new record for trade in goods in Vietnam. Vietnamese automobile firms can gain a competitive edge over their rivals in ASEAN if the domestic supporting industry uses more locally-produced parts, heard a conference recently held in Hanoi by the Central Institute for Economic Management (CIEM). Investors are concerned about a low return on investments in oil and gas projects in Vietnam. Budget carrier Vietjet Air officially launched its first direct flights to Japan, connecting the capital city of Hanoi and Osaka city. After introducing agricultural commodities at SIAL Paris 2018, Vietnamese enterprises successfully received export orders worth millions of dollars. Over 31,000 bank card numbers allegedly belonging to retail giant Mobile World’s customers were leaked online. 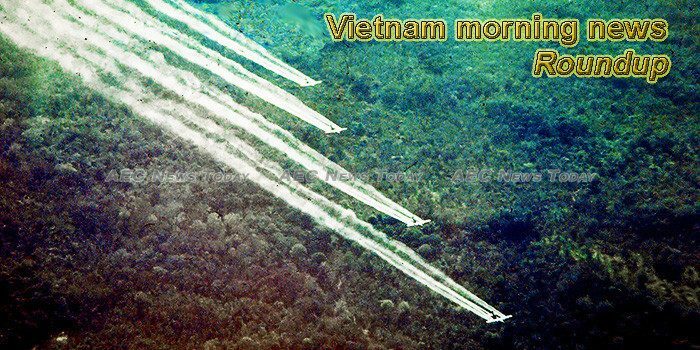 Vietnam and the United States have finished the cleanup of dioxin contamination at Danang airport caused by the transport and storage of the herbicide Agent Orange during the Vietnam War. Viettel Global Investment JSC, a subsidiary of Viettel Military Industry and Telecoms Group, reported revenue of 4,428 billion VND (188.6 million USD) and profit of 1,342 billion (57.1 million USD) in the third quarter of 2018, increases of 5 and 8 percent year-on-year. PetroVietnam – the representative unit of PVTex – affirms that the the contract between Binh Son Refining and Petrochemical Co., Ltd. and PVTex to buy PP (Polypropylene) plastics for production at the Dinh Vu polyester plant is fully legal. The enchanting ‘City of Lanterns’ is certainly one of Vietnam’s dreamiest destinations. Vietnam strongly protested China’s launch of weather stations in the disputed Spratly islands, saying Thursday they seriously violate Vietnam’s sovereignty and complicate the situation in the South China Sea. The agricultural sector earned US$32.6 billion from agro, fishery and forestry exports during the first 10 months, up 8.1 per cent year-on-year, according to the Ministry of Agriculture and Rural Development (MARD). While traditional markets still dominate Vietnamese shopping, convenience stores are becoming more popular. According to Vietnamnews, Hà N?i aims to reduce the use of plastic bags in the traditional markets, supermarkets and trade centres to protect environment as well as ensure the sustainability of the ecosystem. The 2018 international conference on cruise liner tourism aims to introduce Da Nang advantages and the development policy of the city. Phuc Sinh Group started operations at the Phuc Sinh Son La coffee processing factory in Son La Province on November 8 to serve domestic and foreign markets. Remittances from Vietnamese guest workers hit US$2-US$2.5 billion each year with an annual average growth rate of 6 to 7% between the years 2010 and 2017, according to a report of the National Assembly Committee for Social Affairs. On November 7th, 15 shortlisted startups made their pitches to the jury of the ‘Startup Viet 2018’ contest. Despite ready-to-drink coffee remaining a niche category in Vietnam, beverage giants such as Coca-Cola, Nestlé and Suntory PepsiCo are hoping to kick-start the market with new products. After nearly two years of receiving investment from Mekong Capital’s Mekong Enterprise Fund III, F88 made a milestone in officially opening two new stores in Ho Chi Minh City, on Cach Mang Thang Tam Street, District 1, and Au Co Street, Tan Binh district, on November 11. Coffee shipments from Vietnam will set a new record this year, supported by global demand for its key robusta variety. This week’s Vietnam morning news feature photo acknowledges International Day for Preventing the Exploitation of the Environment in War and Armed Conflict, November 6.